Adventure Solu is highly recommend to fine this beautiful adventure destination Mardi Himal which is one the untouchable trek destinations in Annapurna regions trekking foothills trail. 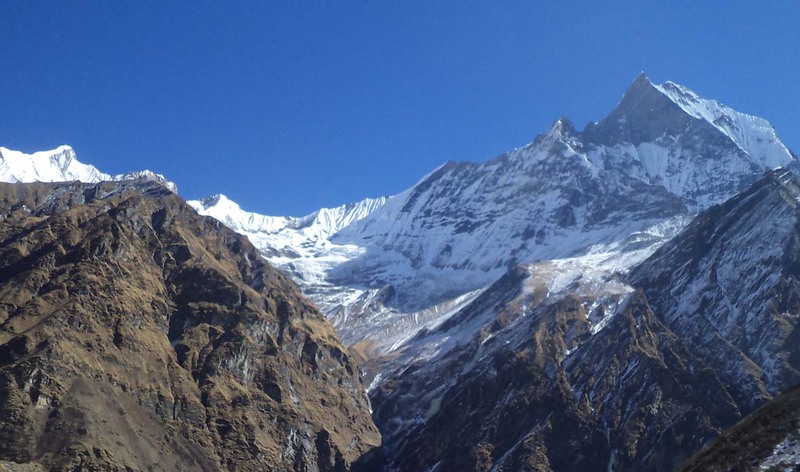 Which is Situated middle west part of Nepal and just east of the Annapurna Base Camp trek, the Mardi Himal trek is a hidden gem, as few trekkers make their way to Mardi Himal’s Base Camp, spectacularly situated at the base of Mardi Himal and the beautiful and imposing Machapuchhre or Fishtail. The trail winds along small paths through ancient rhododendron forests, until you climb out at around 3,300 m. Here, the landscape changes quite abruptly with amazing views of Mardi Himal, Machapuchhre, Annapurna South and Hiunchuli. Day 1 : Arrival and transfer to the hotel in Kathmandu (1360m) Upon arrival in Kathmandu, you will be met by our Himalayan Hikers representative and transferred you to the hotel. The drive from the airport to the hotel is around 20 minutes.After your checkin the group leader will set a time for your trek briefing to discuss in regards to the trek. The evening is free but your trek leader will organise a welcome dinner at a fine local restaurant. Day 2.Drive to Pokhara, 6/7 hours Today we will drive to pokhara which is one of the second largest city in Nepal as knows as a clean and lake city of Nepal. While driving to Pokhara we will pass through many beautiful little town and many local villages, There are spectacular views of the main Himalayan chain to the north, including the 8000 meter peaks of Manaslu and Annapurna during our long drive. After arriving in Pokhara you are free for your afternoon chill and shower , evening you will visit to the Fawa lake which is really beautiful for evening walk, and stay overnight at hotel, Day 3 short drive to kande and trek to Deuralu 5/6 hour Today after our breakfast we will drive by our privet transport to the our trek starting point it's about 1 hour drive on road to the small settlement of Kande situated high up on the ridge the starting point of your electrifying journey is sincerely adventurous about 2 hours steep uphill walk to Australian Camp, your guide will suggest you to have lunch either here or Potana ,one of the most beautiful view points that offer anyone with the most outstanding view of the Annapurna and fishtail ranges mountains front of you. Which makes you enjoyable start your day one trek Next few hours trek it will take us to the small village of Deurali where we will have overnight with the nice local tea house. Day 4 Trek to forest camp ( 2600m) 4/5 hours Today you walk up to a place called forest camp where you will turn off the main Annapurna Sanctuary trek and continue along a quiet trail through a dense forest where we will pass through with many nice rhododendron trees Tonight we stay at one of the lodges in a clearing of the forest at Forest Camp or also known by the locals as Kokar.The lodges are around Mardi trek is mostly quite basic and there is small dining rooms sometimes you will have your meals in kitchen with the owner, which makes you more fun with remote trekking, so in some ways this is more like a home stay and is a good opportunity to get to know this friendly family, Adventure solu trekking crew will be there to assist you to manage nice place for your stay, Day 5. Trek to Low Camp (3150m)- 5 hours walking. Today we will start another beautiful trekking part From Forest Camp to Low Camp the trail continues through the forest however as we ascend the vegetation starts to change with more rhododendron and the trees are covered with moss, lichen and tree ferns. At Low Camp there are also basic lodges. The view from Low Camp is spectacular view, your afternoon stay will be really nice cos of your styling will be above small high hills with holy Mount Machhapuchhre visible up the valley, Day 6. Trek to High Camp (3600m)- 4 hours walking. After your breakfast today you will be hiking higher than where you were last night an hour or so above Low Camp the trail breaks out above tree line and towards the west there is a good view to Annapurna South and Hiunchuli. The trail continues along the Mardi Himal ridge mainly on grass with some isolated rhododendron bushes along the way. Look out for the colourful Danphe pheasant on this section of the trail. The lodge at High Camp also the basic but for sure you will enjoy the scenarios,The view from the lodge is superb to Annapurna South, Hiunchuli and Machhapuchhre (Fishtail ) Day 7. Morning walk to Upper viewpoint trek to low camp (4,200m)- 5/6 hours walking. This is our last destination The plan for today is to wake early for sunrise view of the mountains then after an early breakfast hike up to the ridge towards Mardi Himal. There is a well established trail through the grass with a couple of steeper sections however overall not too challenging. Look out for the dzopkyo (yak/ cow crossbreds) grazing up here as well as Danphe pheasant( nationalbird). In the summer the sheep and goats from lower villages are brought up to graze in this area so you will pass a number of herder’s huts along the way. After three hours you should reach Upper View point at 4200m this is where one can look into the Annapurna Sanctuary and the panorama view is spectacular looking at south face of Annapurna and all of the peaks in the Sanctuary as well as Hiunchuli and Machhapuchhre (Fishtail) after finishing your nice high climbs you will desent to hi camp lodge and have a lunch after finishing your lunch you will start second part of your trek down to low cam and sleep overnight at low camp. Day 8. Trek to Siding village (1750m) -6 hours walking Now more easer to breathe while your down hills walk slowly and carefully enjoying with the view the.On the return trek we take a different route so completing a circuit, from Low Camp there is a trail that goes down to Siding village rather than going back down the same way Mardi trail. Trek to Siding village is a traditional Nepalese village and still very much away from the busier tourist treks and it is likely you will stay at a home stay in Siding owned by the person who runs one of the lodges at Low Camp. It is a wonderful cultural experience finding out more about village life with the family in their kitchen. Day 9. Trek to Lwang Village today you will walk down to lwang hich is really beautiful settlement of the local Nepalese house where you will pass through many different farms and rice paddy from Siding you walk out to the road head at Lumre, on the way from Siding you will pass the villages of Kalimati and Ghalel. Kalimati is mainly a Brahmin village with Ghalel and Siding mixed Brahmin and Gurung. at Lwang we will stay overnight before leaving clean and fresh mountain air Day 10. Short walk drive to Pokhara. Today is a free day to rest and relax in Pokhara after the trek, go shopping or to explore and do sightseeing around the city by yourself . It is possible to hire a boat to row out on Phewa Tal lake and visit Barahi temple on an island in the lake or just relax. Meals included: B Day 11. Drive to Kathmandu. Approx: 6/7 hours After breakfast we drive back to Kathmandu. We will drive same as we drive from kathmandu wherever if no any bad traffic we will drive around 6/7 hours .On arrival in Kathmandu we are met and transferred back to our starting hotel. The rest of the day is free to do shopping or further sightseeing. Day 12. Fly back home. Our trip ends today depending on your flight scheduled we will transfer to airport and say good bye . Your guide will be on hand to advise and assist with your onward travel arrangements. Trek Preparation for Nepal Trekking in Nepal is one of the best destination for your holiday, Nepal is one of the land locate country with steepness hilly moraine part where you will trek lots of ups and down, start from 800m and 2500m to your destination what you are doing as per your itinerary, all the trek destination are not easy but here kids and early age up to 70 years old trekkers are doing well and successfully done the here trek in Nepal. Have you ever done the trekking, hiking and climbing around the world or usual day hike around your place, if you never done the those activities and still your planning to go Nepal for trekking, very basic things before you are choosing your holiday in Nepal is like usual running, gym, play any sports, walking up and down, hill climbing are your preparation with your hiking boots, practice with your day pack and do training for packing as well at list 7/10 kilogram of your day pack with all needs like drinking water on your day back, do the practice at list 15 to 20 days before you are doing trek in Nepal, if you have a bad ankle, sick body, bad knee, poor eye contact consult with your doctor before you get in here, if you are taking your personal medicine as your doctor prescript bring your personal medicine for whole trip , and select your clothing enough and worm. before your trek start Adventure Solu your guide will assist you to check your trekking gear at Kathmandu, find your trip and select your clothing, don’t worry about you how fit enough Adventure solu has very well design itinerary for your trip and Adventure Solu team and your trekking guide will assist you to get there, if you are slow you will still have a assistant to assist you to get your day by day destination.